There is more to having a good home then a nice couch or good stove. We desire to add a bit of luxury to our homes and to do so some of us spend a but more on certain items. For instance, some will purchase a comfy, expensive leather sofa for their living room while others will prefer to equip their bathroom with well designed bathroom equipment. If the latter suits you, and money is not an obstacle, investing in a posh bathtub should interest you. 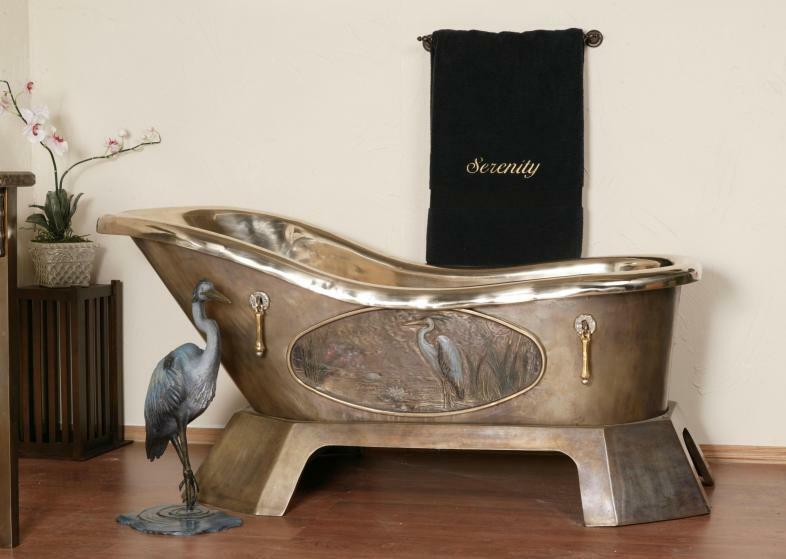 Let us get an insight towards the 10 most luxurious bath tubs. The price: $34,000This is an unfussy tub with an infinity-pool like feature. 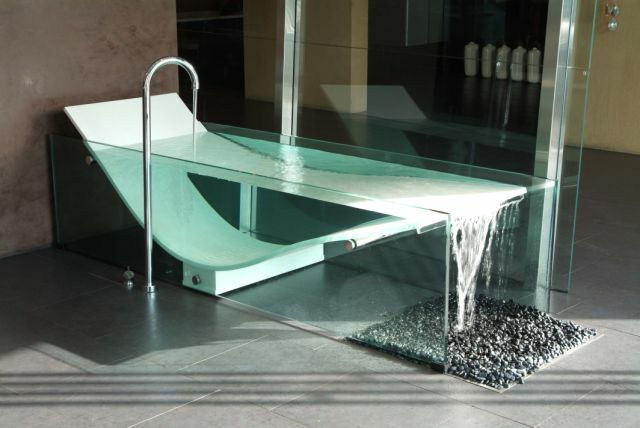 A relaxing zen effect is given by the overflow of water from the tub into the tub's rear and onto the bed of pebbles underneath. One beautiful thing about this tub is that it is not big enough. That's right. The fact that it does not hold so much water makes bathing more about relaxing rather than cleansing your body. 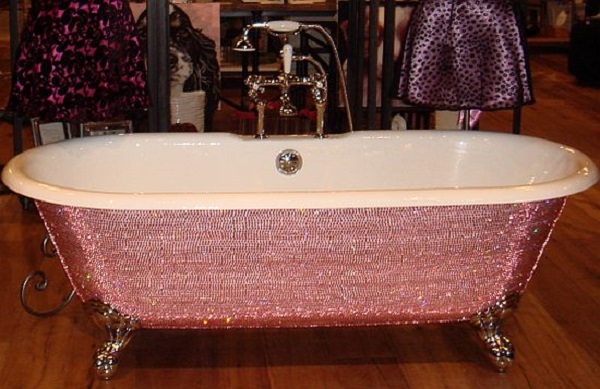 The price: $39,000This tub is a creation of Lori Garner. It is expensive and crafty, with about 45,000 traditionally set Swarovski crystals. It has well designed, cast-iron claw feet, where each foot is carefully attached. The artisan's took 3 years of tedious work and a lot of attention to finalize the classy tub. The price: $47,200It is a design by the one Aldo Puglielli. It is built with 18 karat solid gold nuggets of mass 42 grams. The designer created it for Watergames Technologies. This modern and luxurious tub has multicolor lighting, 42-inch waterproof HDTV, Swarovski-encrusted champagne holders and massage. 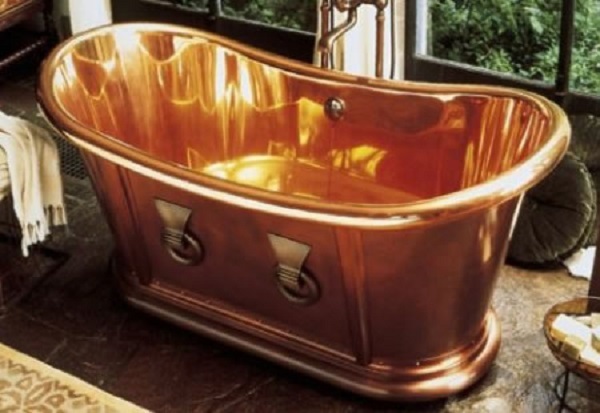 The price: $67,557The same people involved in restoring the Statue of Liberty's torch handcrafted this copper tub. It is spacious enough, considering it is 5 feet long and 2.5 feet wide. With this space it can accommodate anyone. It has a handheld shower unit with a starfish engraving on the knob. The Price: $76,658.40This piece is 2 feet tall & 18 inches deep. It is styled from solid bronze with silver and gold accents. A dozen of the same beautiful bathtubs were made. 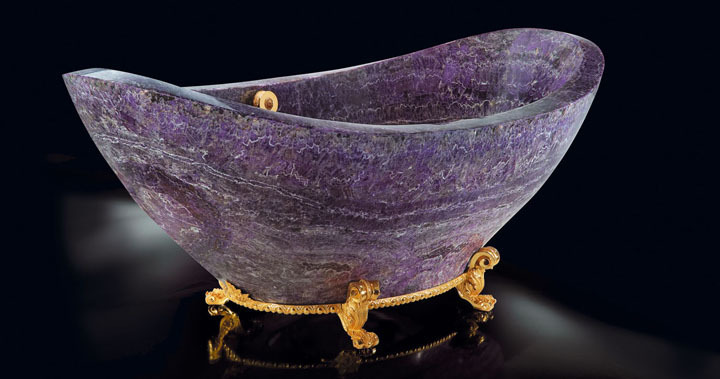 The price: $121,200It is a purple beauty with 24-karat gold legs. With it comes matching accessories; lotion dispenser, tumbler and a soap dish. Curious about how much the solid Amethyst is worth? Then you need to get back to the 18th century, just like ruby, diamond, emerald and sapphire, Amethyst was considered a rare gemstone. 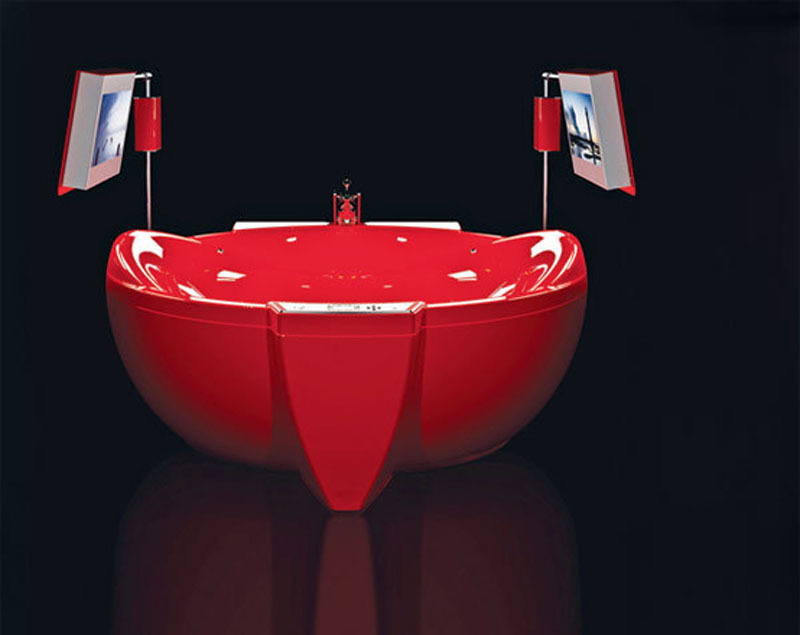 The price: $222,000The designer of this fabulous boat-shaped tub is an Italian luxury designer called Luca Bojola. He crafted it using pure turquoise malachite and set it on 24 karat gold plated feet. The price: $790,310Luca Bojola designed 3 pieces of ultra high-end bathtubs for Baldi, Italian interiors firm. He made use of 10-ton Amazonian crystal to carve each piece. In addition, it is sculpted with diamond cuts. 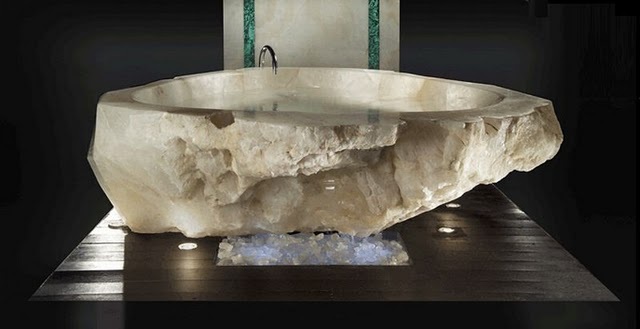 The partial rough edges on this tub enhance the natural beauty of the rock used. Two of the pieces are already sold. One was purchased by a Russian tycoon for about $858,763 back in 2008 and the other by a British socialite by the name Tamara Ecclestone for $1,000,000 in 2011. The remaining piece is at Harrods and is valued at the above price. The price: $987,000Just in case you did not get the name clearly, it is made of gold. A Japan hotel, Kominato Hotel, opened the tub for use by their guests. They were just allowed a few hours each day for security reasons. Despite that minor restriction, it was a main attraction for visitors. It makes one think if the elite would just visit the hotel to use this tub. Made of solid gold, this beauty piece weighs 176 pounds. One funny thing, this piece was stolen back in 2007. Not even one witness was found. The price: $1,700,000It is carved from a gemstone called Caijou. Caijou is a rare gemstone used by ancient civilizations as it is believed to contain healing properties. It is so rare that the source of the gem is still kept a secret. 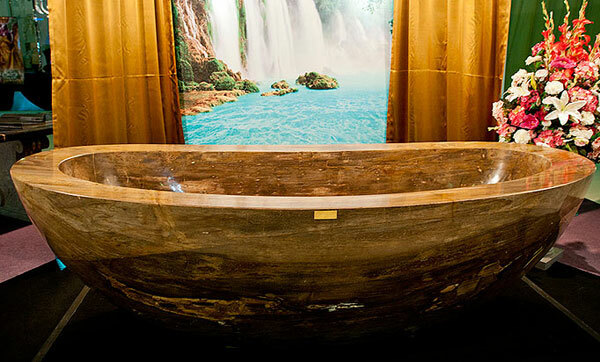 Simon Krapf, the designer, used 10-ton of this gem to craft the tub in the shape of an Indonesian canoe. Together with a team of other stonemasons, he spent endless hours to complete this piece.The most expensive piece was sold to an anonymous buyer at the Dubai International Jewelry festival.